There were far more one-hit-wonder’s on the UK chart than you’d think. This week’s act is from the Netherlands and having a quick check I notice there have, so far, been 110 one-hit-wonders from the Netherlands, however, this week’s subject is actually a two-hit-wonder, but I defy anyone to remember the name of the follow-up. Just checked the two-hit-wonder from Netherlands situation and there are 37. OK, let me test you on their second hit –a number 63 – who remembers Ain’t My Beating Heart? Anybody? No. Ok, what about their only other hit, the number 10 debut called You in 1992? A-ha, IU hear you say. Correct, it’s Ten Sharp. 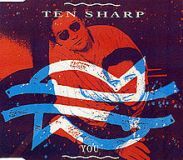 Ten Sharp were formed in 1984 by singer Marcel Kapteijn and keyboard player Niels Hermes who, in-turn, began their careers in two different bands, Prizoner and Pin-Up respectively. In 1982 they found themselves in the same room and got chatting and decided to form a band together called Streets. They recruited guitarist Martin Boers, bass player Ton Groen and drummer Joop van de Berg and made their debut at the Hutspop Festival in March the same year. The festival is held annually in Leiden, a city halfway between The Hague and Amsterdam. It’s really more of a competitive challenge for musicians from the Netherlands, probably a bit like a live X-Factor, but some years before Simon Cowell brought it to our screens. In the summer of 1983, and still without any real success, they suffered a further set back when Hermes had a number of guitars stolen which resulted in him having to buy new equipment and decided to buy a couple of synthesisers, the Roland JX-3P and Yamaha DX7 which gave the band a completely different sound, so they put their heads together and wrote a stack of new songs. They bought some studio recording time and laid down three songs including When the Snow Falls which was planned as the first single release. The demo was heard by someone at CBS in the Netherlands and before long they signed a deal with them. They had a meeting with the record company who informed them there was already a band in the State called Streets and so they had to choose another name, which was done during that meeting and Ten Sharp was chosen. As planned When the Snow Falls was their first single and peaked at number 50 in the Dutch chart. Next came Japanese Lovesong which fared slightly better by peaking at number 39, but failed everywhere outside of their native Netherlands. Even worse, their next two singles, Last Words (1986) and Way of the West (1987) failed to make any chart anywhere. Then came success, You, which was written Niels Hermes and Ton Groen and tells the story of a man who has finally found the woman of his dreams and describing how lost he was until he found her, clearly stuck a chord, like so many ‘real life’ songs found its way into the hearts of millions. Released simultaneously across Europe it reached number one in France Norway and Sweden, number two in Austria, three in Switzerland and their home nation, four in Germany, Finland and Ireland and number 10 in the UK where it spent 13 weeks on the chart. The parent album, Under the Water-Line, made the top 10 across Europe, but in the UK it stalled at number 46. The albums kept on coming; The Fire Inside (1995), Shop of Memories (1995), a Best of Everything and More (2000) and Stay (2003), none of which troubled the pockets of the record buying public in the UK. In 2016, Marcel Kapteijn and Niels Hermes are still working on spreading their musical past around Europe, but mainly in countries close to home.